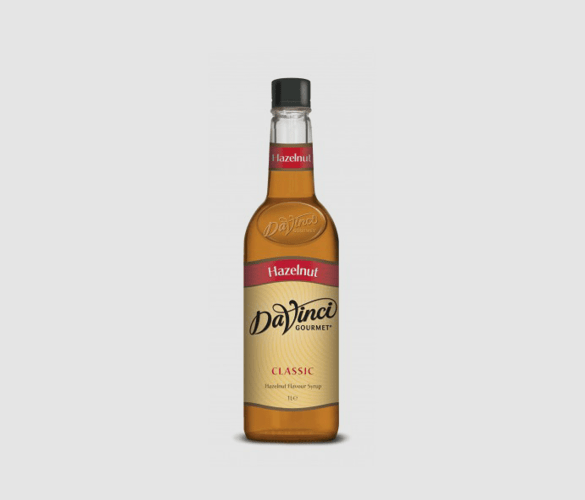 Bring a warm and comforting nutty flavour to your beverages. Hot or cold, this syrup will add something special to your drink. The unique flavour is the perfect balance of sweetness and nuttiness. It will add a subtle taste without overpowering your creation. Hazelnut is a popular ingredient used in so many products and recipes, and it’s not hard to see why. Use this popular flavour to expand your menu and you will not be disappointed by the reaction of your customers. Let baristas experiment with different flavour combinations to create an exciting new line of beverages. How Can I Use This Hazelnut Coffee Syrup? This product is so easy to use as a little goes a long way. We recommend starting with a small amount and increasing the serving size until you achieve the desired taste. This is a great option for those who don’t want a syrup that is too sweet. Different amounts will work in different recipes and the most fun part is experimenting. Use with confidence as the formula has been specially designed to combine seamlessly into drinks. This product will give an even flavour throughout and it will resist curdling to give a silky, smooth result. Serve in cappuccinos, lattes, americanos, tea and much more. Also try this syrup in desserts such as cakes, pastry’s, brownies and cookies. With a little creativity the possibilities are endless. If you love coffee and hazelnut as much as we do, this recipe is seriously a must try! The cupcake is light and fluffy, and the buttercream is rich and luxurious. They are great as indulgent snacks on a gloomy day. This recipe is from Feastie and is a great way to treat your friends and family. Preheat the oven to 180°C. Add cupcake cases to a baking tray. In a mixing bowl combine the flour, hazelnut flour, baking powder and salt. In another mixing bowl, whisk together the sugar, melted butter, eggs and vanilla extract. Mix the dry ingredients into the wet ingredients bit by bit. Stir in the hazelnut syrup. Add about a large tablespoon of mixture into each cupcake case and bake for 20-25 minutes. They are done when a metal skewer can be put through the centre and come out clean. Take out of the oven and allow to cool. For the buttercream, whisk together the egg whites and sugar. Put the mixture into a mixer and whip until smooth and glossy. On a low speed, add the butter a tablespoon at a time. Then add the espresso. Swirl the buttercream onto the cupcakes and dig in!